Whenever a new product comes out, the first thing a user must decide is whether to upgrade or not. So in our last poll we asked you what you were going to be doing. 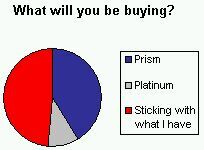 Surprisingly, over half of the respondents will be upgrading, with the vast majority of upgrades going to the color Prism. Here are the numbers, and we also have a pie chart to put things in perspective. Our next poll is on which wireless provider you're most interested in. I personally am not sure at this point, but time will tell.